I am really impressed by the precise construction of the wing. You did an excellent job making these wings. I wish I started building my Taboo earlier so that I could have had it done by this weekend's contest. Unfortunately my building time is limited so my sailplane construction projects take me longer than I'd like. 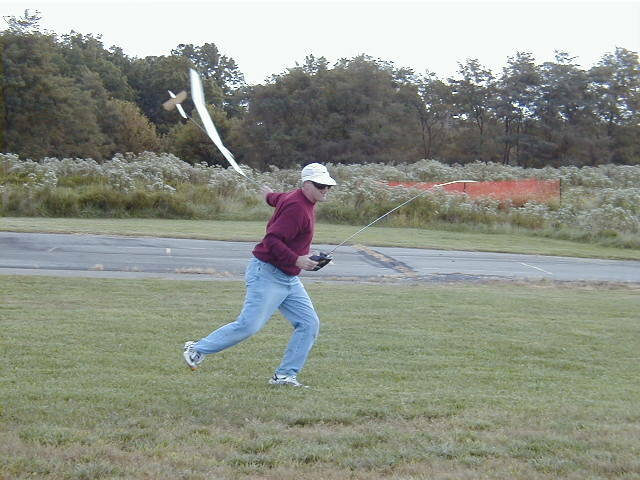 Oleg, I completed my Taboo several days ago and flew it for the first time today (7/4). 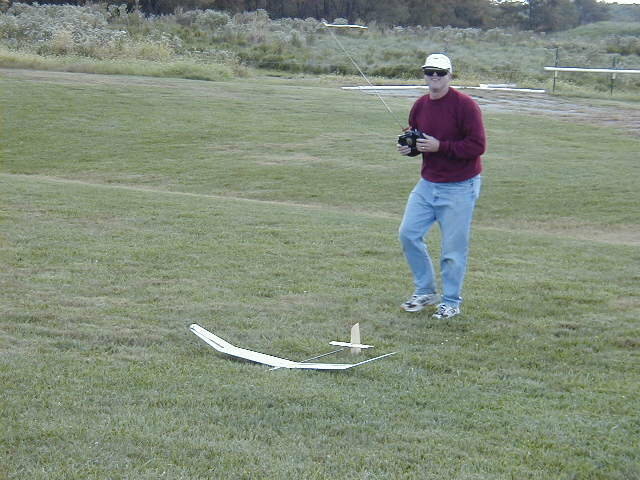 I can sum up my opinion of the Taboo as follows: It flies better than any sailplane that I have ever owned. I remember being impressed watching you launch your Taboo at the BASS contest. Your launches were extremely smooth and very high. I was able to do similar launches after several practice throws. I was putting very little energy into the launches but was able to get higher launch altitudes than with any of the previous sailplanes that I have flown. The amazing thing about my Taboo is that I am able to launch it without a preset. I throw lefthanded. When throwing a dlg I always give a little left rudder with my thumb. I noticed that I was able to do "thumbs-off" launches. I would keep my thumb ready to apply a little left rudder just in case, but it was not needed. 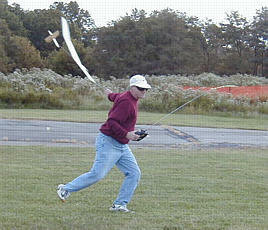 This little sailplane launches like a rocket and floats like a feather! You did an amazing job when you designed this aircraft. The spar reinforcing worked perfectly. I am enjoying flying my Taboo. I estimate that I have over 1000 launches on it. The spar reinforced wing has held up great. I do not have to put a lot of energy into the launches to get good altitude. The sailplane seems to have a very low drag coefficient (I don't know if that's the right term) because it just seems to "slide" through the air. I got the Taboo today! Everything arrived in great shape. You did a good job packaging the plane. The craftsmanship on this sailplane is superb. The amazing performance of my first Taboo is what led me to purchase this second one. As I told you in an earlier email, I estimate that I now have over 1000 launches on the Taboo that I purchased from you in May at the BASS ECHLC contest - and it still looks new. This plane launches so easily and so high - with no preset and no gyro! Thank you for making this kit available to your fellow modelers. 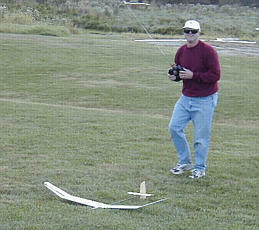 I currently own and fly three of the "major" DLG kits. Of them the Taboo is my going away favorite. All fly well, but the Taboo seems to handle better then "S" or the "R". I usually tell folks who ask that "the Taboo has merely to get within a half acre of lift to climb out"! We recently started doing measurements with a laser range finder, -I- launch the Taboo higher then the other two, usually by 5-10 feet! Both the "S" and the "R" benefit from using gyros, something -I- find not true about the Taboo. The Taboo settles into a great climb with only minimum tail wagging. I guess there is something to be said for -PROPER- aero engineering. I still think the Secrete was the best handling HLG I have owned, but the Taboo is an extremely close second! I can easily do 1 minute with either the "S" or the "R" , but am VERY close to two minutes with the Taboo! Signed, "an EXTREMELY happy Taboo owner"
Oleg, I should have given you feedback sooner but my Taboo won't come down! Seriously this is the best HLG/DLG. I have ever flown. I am a big strong guy and have thrown discus in track and field. I never have to "hold back" on this beauty! She tracks straight and level from hard launches and has yet to roll except for a slight smooth curving turn to the left. Often guys will come up and ask what kind of gyro I use and their jaws drop when I say "NONE". Aside from the launch she flies great with an extremely low sink rate. Two weeks ago at Valley Forge Park I was tossing it while I waited for my Hera battery to charge and worked two low small thermals into the "sweet zone" and in a few minutes was flying with the unlimited planes in SPECK CITY. What a great feeling! Lots of back slapping and complements after that one. I would also like to say that the high degree of prefabrication and the quality of your work is the best I have seen. This made the building phase a breeze. I know several guys that are going to contact you to order their Taboos. You can certainly use my endorsement on your site. I am going to try to get down one of the days to the CASA Competition to learn the mechanics of timing . I have yet to attend one due to other commitments, but I hope to enter some next season now that I definitely have the right plane to fly.